The glute muscles are the most important muscles in sports and every day life.The stronger the glutes become, the more strongly they contract and safeguard against pain and injuries. Most people have weak glutes. Even people who think they have strong glutes almost always have very weak glutes in comparison to how strong they can get through proper training. Some of the injuries that may result from inactive, weak glutes are pulled hamstrings, patello-femoral syndrome (knee pain), piriformis syndrome, ACL tears, low back injuries, hamstring, groin, and even shoulder injuries. I have my clients do multiple glute exercises in a workout so that the three gluteal muscles are strengthened. 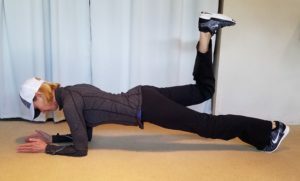 I like the Front Plank with Hip Extension because it was ranked as one of the top exercises for muscle activation of both gluteus medius and gluteus maximus in a study that compared top exercises as well as several other commonly performed clinical exercises to determine which exercises recruit the gluteal muscles, specifically the gluteus medius and maximus, most effectively. Lie on your stomach on the floor in a plank position with arms bent, palms and forearms on the ground, fingers pointed forward, legs straight, and on toes. Engage your abdominal/trunk muscles. It should feel like you are tightening a corset around your ribs, waist and lower torso. Contract your thigh muscles to straighten your legs and lift your body off the floor. Next, while in this plank position, lift one leg off of the ground, bend the knee, and bring the heel toward the ceiling for one beat, hold for one or two seconds and then return to parallel for one beat. Repeat 12 times each leg. Contract the glutes and keep them contracted the entire 12 reps.
World renowned spine expert Dr. Stuart McGill has proven the Cat Camel exercise is the best way to take the spine through range of motion without load. This spine-friendly exercise preserves the ability to do daily tasks that often flex the spine, such as tying your shoes. The Cat Camel helps floss neural tissues, lubricates the spine and preps it for more strenuous activities. It also helps increase middle/upper back mobility. Begin on your hands and knees and slowly begin the movement by bringing your head and pelvis towards each other which rounds your back into the camel position. Then raise your head and push your hips upwards, creating an “angry cat” arch in your back. Do this slowly and gently, and don’t force it. One cycle should take four seconds. Repeat five or six times. Improper shoveling technique can lead to injuries like a herniated disk, pulled muscles in your shoulder or upper back, or strained lower backs due to overuse. By increasing the work load on these body parts in a very short period of time this leaves the muscles and other structures in the area (discs, nerves, ligaments, etc.) at risk for injury. Correct shoveling techniques can reduce your risk for injury. First, warm up your muscles by walking, marching in place, or doing squats or jumping jacks, for ten minutes before you head outdoors. Pick the right shovel. Choose a shovel with a small blade. This will help you by not lifting as much so less strain is on your back. Select a shovel that is comfortable for your height and strength. A short handle will cause you to bend more to lift the load. Using a shovel that’s too long makes the weight at the end heavier. Space your hands several inches apart on the tool grip to increase your leverage. You might consider an ergonomic shovel that has a curved handle and is designed to take the stress off your back. 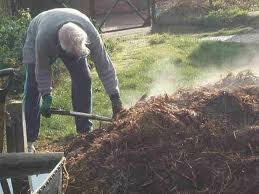 Begin shoveling slowly, allowing your body to become accustomed to the load demands. Instead of lifting, push the shovel to move the material whenever possible. When you do have to lift, squat with your legs apart, knees bent, stomach muscles tight and back straight. Take a small amount of whatever you are shoveling, then lift by straightening your legs, without bending at the waist, then walk to where you want to dump it, holding the shovelful close to your body. Don’t throw over your shoulder or to your side because twisting while throwing. Never rotate or twist your body. Pivot with your feet. This will keep the load off your spinal tissues as well as protect your shoulders. Remember the rule “nose follows toes”. Your nose and your feet should always be pointing in the same direction. Pace yourself by taking frequent breaks. Stand up straight and walk around periodically to extend the lower back. Try this stretch before, during and after your shoveling: Lean backward, look up and reach your arms toward the sky and slowly exhale. This will provide relief to the spinal muscles that are doing much of the work while you are bent over shoveling. Repeat 3-5 times, stretching 10 seconds on each round. If you do experience a strain. Keep in mind that most pain goes way after a day or two. Apply a cold pack as soon as possible after the injury at least several times a day for up to 20 minutes and take an anti-inflammatory such as Ibuprofen or Naproxen. After two or three days apply heat.